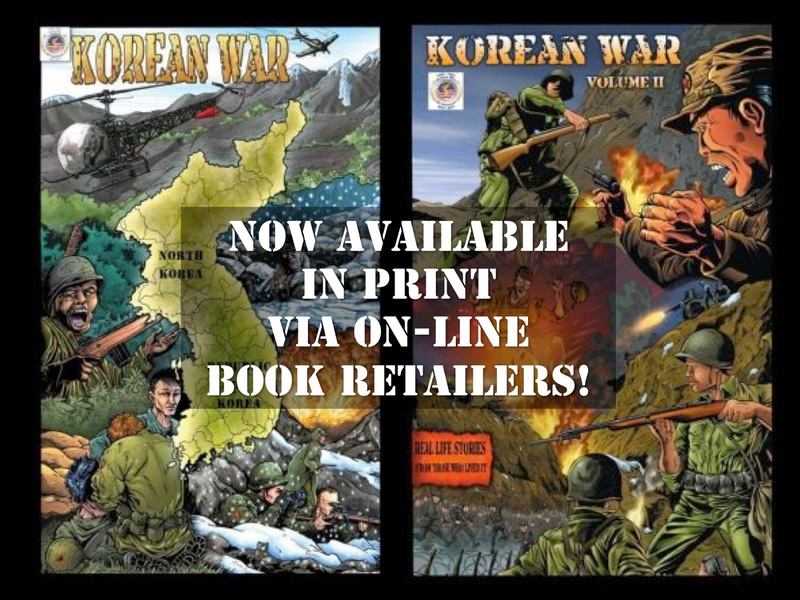 Two graphic novels commemorating the 60th Anniversary of the Korean War are now available in print via on-line retailers, thanks to a successful crowd-funding effort conducted by a group of comic-book artists, veterans, and military supporters last November. Originally written and drawn on behalf of the U.S. Department of Defense for a June 27, 2013 commemoration, the graphic novels were never printed—possibly due to budget sequestration in 2013. Coincidentally, the Korean War is sometimes called "The Forgotten War," because of the lack of public attention it received during and after the conflict. Clayton Murwin, founder of Heroes Fallen Studios Inc., is the comic-book impresario who spearheaded the project. "These stories need to be told, they need to be put out there for the public, so that they'll be a lasting legacy," he said during the fund-raising campaign. After copyright had been returned to the artists, Murwin and his fellow creators sought just $2,500 to help prepare the two finished, 50-page volumes for publication via a print-on-demand service. Contributors to the Korean War volumes include: Jerry Bingham, Valierie Finnigan, Fletcher Horton, Levi Erickson, Scott Lee, Richard Meyer, Travis Miller, Clayton Murwin, Dan Monroe, Tom Orzechowski, Brian Shearer, Le Beau L. Underwood, and Eric White. A number of contributors are military veterans themselves. Murwin recommends the books for most ages—the graphic novels aren't too graphic—although he cautions parents to preview the works before handing them off to younger children. After all, one can't accurately depict war without depicting a certain amount of violence. "[The project is] not so much about the violence," Murwin says, however, "it's about the sacrifice and dedication these veterans put through their service." "Korean War, Vol. 1" tells stories centered around the Battle of the Chosin Reservoir, which occurred in November and December 1950. The book is written and illustrated by Richard C. Meyer, colored by Eric White, and lettered by Tom Orzechowski. Meyer is a U.S. veteran of the Iraq War, having served in the 2nd Battalion, 5th Marine Regiment from 2000 to 2004. He served in the U.S. Army from 2006 to 2010, and deployed to Iraq and Afghanistan. He previously wrote and illustrated the 2008 comic "No Enemy, but Peace," which tells the story how U.S. Marine Sgt. Marco Martinez earned the Silver Star at the 2003 Battle of At-Tarmiyah, Iraq. Meyer's Chosin Reservoir narrative moves from the ground war to that of Lt. j.g. Jesse Brown, the U.S. Navy's first African-American aviator, as well as his squadron-mate Lt. Thomas Hunter. Flying carrier-based F4U "Corsairs," Brown and Hunter were providing air-support to U.S. forces encircled at Chosin Reservoir when Brown's aircraft was hit by enemy fire. Hudner deliberately crash-landed to aid Brown, who was trapped in his cockpit. Hudner was later awarded the Congressional Medal of Honor for his actions, while Brown was posthumously awarded the Distinguished Flying Cross. "Hill 472," a story of U.S. Army Cpl. Ronald Rosser, a recipient of the Congressional Medal of Honor. Cover art by Jerry Bingham, colors by Eric White, script by Valerie Finnigan and Scott Lee, pencils by Dan Monroe, inks by Brian Shearer, and letters by Tom Orzechowski. "Guts," a story of U.S. Air Force pilot Maj. Gen. Frederick "Boots" Blesse. Qualified on multiple fighter aircraft, inluding the F-86 "Sabre," Blesse is the nation's sixth-ranking fighter jet ace. "Seventeen," a story of U.S. Army Pvt. David Mills, who was 17 years old when he was taken prisoner during the defense of Outpost Harry. "Valor," a story of U.S. Army Cpl. Rodolfo "Rudy" Hernandez, who was once declared dead after the defense of Hill 420, about 15 miles south of the current border. During that action, Hernandez fixed his bayonet and charged, killing six enemy fighters before losing consciousness from grenade, bayonet and bullet wounds. He is a recipient of the Congressional Medal of Honor. For more information about Heroes Fallen Studios Inc., click here. Or visit the organization's blog here.